A new gallery opened in the L.E.S. of New York City earlier this month. Gallery City Lore's inaugural exhibition is uniquely New York from a bygone era. 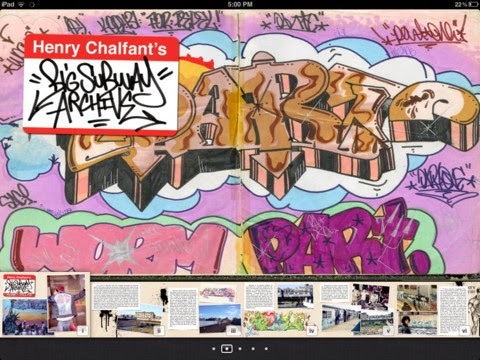 Moving Murals: Henry Chalfant & Martha Cooper’s All-City Graffiti Archive celebrates a “Golden Age of Graffiti." When the city's subway cars became a rolling steel gallery that only the most daring artists got to exhibition in. “We want [visitors] to be astonished by the creativity of these kids who at the time took their life into their hands and risked jail, basically, to be able to go into trainyards to create these beautiful if ephemeral murals,” said City Lore founding director Steve Zeitlin. Back to the 21st-century Henry Chalfont's iBook entitled "Big Subway Archive" was also at Gallery City Lore to offer visitors an insider's look into the art of subway graffiti trains. The iBook experience is immersive with 800 multimedia photos, 50 artist interviews and videos. "These classic train murals, which have been the inspiration and guide for thousands of youthful artists around the world, did not survive on the trains for long before the city cleaned the cars, or the artists’ rivals painted over them. Chalfant and Cooper’s patience and determination in hunting down and capturing these ephemeral masterpieces with their cameras has left the world with a representative cross section of some of the best work by the most talented young artists who painted New York City’s subway cars in the seventies and eighties. These images pay homage to the young artists from the City’s underserved outer boroughs whose work—though often dismissed as vandalism—challenged contemporary fine arts standards, and lit the fuse for the street art and hip hop explosion heard around the world." Henry Chalfont's Big Subway Archive. Gallery City Lore is part of City Lore, the 28-year old cultural organization whose mission is to "foster New York City – and America’s – living cultural heritage through education and public programs." Exhibition runs until July 10th, 2014.